The last day of EMSSA had a real reflective feel to it. A day to think about where we have come from, where we are and where we are going. There were some fabulous presentations today, and we’ve not managed to capture them all here (sadly). The theme for the morning was based around the African Federation of Emergency Medicine (AFEM) presenting the session on Global Emergency Care. This conference marks AFEM rebranding and redefining their entire brand moving their focus to a sustainability model for Emergency Care in Africa. The reason for being “ikigai” is explained by a personal story about why Heike got involved in the federation. How developing this organisation is just something she had to continue doing. Building sustainable leaders by nuturing leadership in Africa will be a key goal for AFEM. With this the new President Elect was announced as Benjamin Wachiro from Kenya. Ben is a truly amazing person qualifying as a medical doctor in 2005 from the University of Cape Town, he continued his education at the University of Cape Town to qualify as an Emergency Physician in 2012. Afterwhich he returned to his home country of Kenya to take up several challenges within the African context. Ben is currently an Assistant Professor at the Aga Khan University Hospital in Nairobi. He is also a section editor for the African Journal of Emergency Medicine and the medical director for Kenya’s Council of EMTs. We look forward to see what the future brings. AFEM is also proud to introduce introducing their new their all new website www.afem.africa. We have to work together by planning and including all disciplines that work within the healthcare response. Keynote: Roger Dickinson on the life after. Roger Dickinson is a South African emergency physician and intensivist who now works in Cape Town. His life in and around EM was the theme of this talk. So what do we mean by ‘the life’ in emergency medicine? Is it all about excitement and tragedy, the rough and tumble of EM. Great presentation using video, music, and images to convey the emotion of our professional lives. I happen to know that Roger is a huge Queen fan, and so we were treated to a lot of Freddie Mercury in this talk. He talked about the train of education that begins in school and which can carry us through to our final destination of……well what? Those initial decisions about choosing a career are challenging at the time, but we make them, and then we jump onto the next career train, that takes us to the next destination and the next decision. Looking back our lives are full of decision points, that ultimatley characterise where we end up. We get to the end and then what? In medicine we often feel that we have to put our lives on hold to get to the next summit of achievment. This is great, in some ways it’s easy to follow a prescribed path, but what happens when you get out the other end? What is it th`at you are supposed to do next? Roger has spent time thinking about the life after training. Too much of our training lves are charactersised by delayed gratification of putting life on hold whilst we wait to pass exams or reach the next waypoint. We do need balance in our lives and that can be particularly difficult when we look around for people to emulate. Roger talked about the careers of Heike, Sa’ad Lindy-Lee, and Lee who are clearly overachievers. Are they the right people to look to as mentors and role models? In the end it turns out that Willem Jooste was the colleague Roger found to help him see life in a new way. But back to the theme. Why is it that our colleagues are struggling with a balance between ‘life’ and ‘work’? Roger reached a point where he began to worry about the future, ahout how we can improve morale and how we can support each other. Alcohol is an issue here (and elsewhere too). Data from the UK via RCEM 62% of consultants reported that their job was unsistainable. Similar data is available from the US and Australia too. We need to stop thinking about the life after and think more about the life now. We should not be thinking about how things will be better when we stop, but rather how we improve things now. Now means thinking about things like family, friends, exercise, health, hobbies and ultimately me. In fact Roger breaks it down into four main things for us to think about. Health – look after it, treasure it. Friends – becuase you can tell them things that you can’t tell your family! Me – why does this come last? Perhaps it shouldn’t. Perhaps we should do a little more to look after ourselves and not be afraid or guilty to do so. Roger challenges us all to take stock and think about where we are going in our lives and what we might do to help ourselves to have a happy and fulfilling career and life. 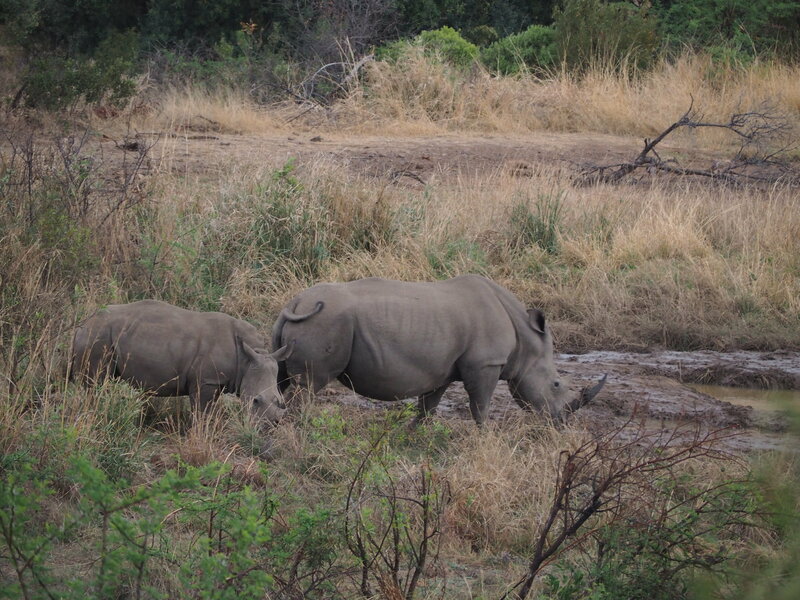 Steve Dell → Rhino Protection in the Pilansberg. The EMSSA conference is nextto the Pilanesburg national park and so we were delighted to hear from the Pilanesburg rhino trust about rhino protection here in South Africa. Sadly the number of Rhino’s are still being poached. Over 550 Rhino just this year including here in Pilanesburg. At current rates more Rhino are being poached than are being born and so we are looking at an extinction vortex for both black and white rhino. In addition more rhinos are being injured as a result of poachers working at night and using suppressors (to deaden the sound). Basically they are much less accurate because of this and as a result many get injured. Animals are now marked and DNA matched so that future convictions can be more secure in the future. This hopefully can be used to trace rhino products across the globe. There are now rhino protection units in the parks who are a dedicated group of rangers who are solely tasked to protect the rhino. This strategy is really based on the rangers themselves. They are the ones fighting the war against poachers every day and night. Looking after them is really important. The bottom line is that this is really tough. It’s clear that the rangers and the park staff are really passionate about rhino protection. The future is uncertain and perhaps a bit bleak, but there is hope so long as the public support the projects and so long as we all believe that the world is worth saving. This was a really thoughtful presentation that really makes you stop and think about the future of the planet. How much longer will we be able to see these magnificent creatures in the wild? Many thanks to everyone who put this conference together. It was a fantastic group of people delivering some amazing lectures in the company of inspirational colleagues. Special mentions go to the following. 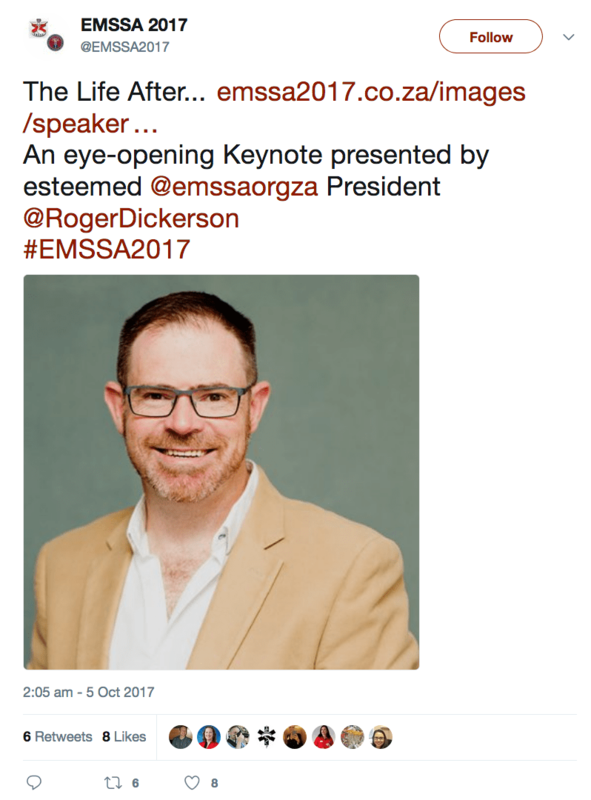 Firstly we must mention that Roger Dickinson was awarded the Order of EMSSA for his incredible contributions to emergency medicine here in South Africa. A very well deserved award. Don’t forget to check your diaries and book your flights for for Kigali, Rwanda in 2018. It will be another great conference in an amazing place. 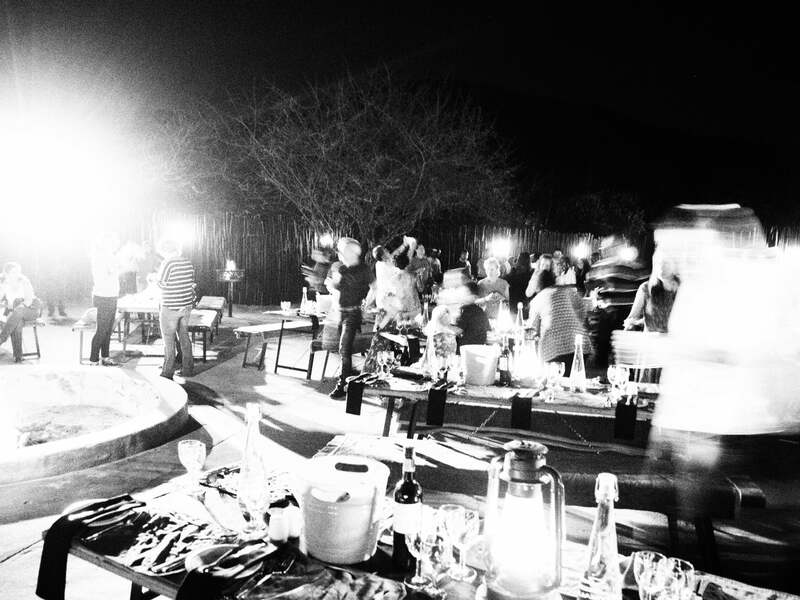 If you can’t wait until November then why not join us in Cape Town in March 2018 for the #badEM fest. That’s going to be amazing! This blog and the other 2 in the EMSSA series were cocreated by a range of authors. Apologies if I’ve missed anyone! By co-created we mean that we all logged into the same online document and wrote the blogs as they happened. We used the Papers function on Dropbox. This appeared to work really well for capturing the conference narrative. Thanks to all.